Theirs your picture Jim. The carts looking good. The Mattmobile! I read that in another post. Perfect! Matt, your cart is just way too neat and tidy :-) I love your blog and what you are doing. Makes me feel like hitting the road myself. After all those bad, rocky roads, your cart looks like it’s still in good shape. Do the tires have any tread left? 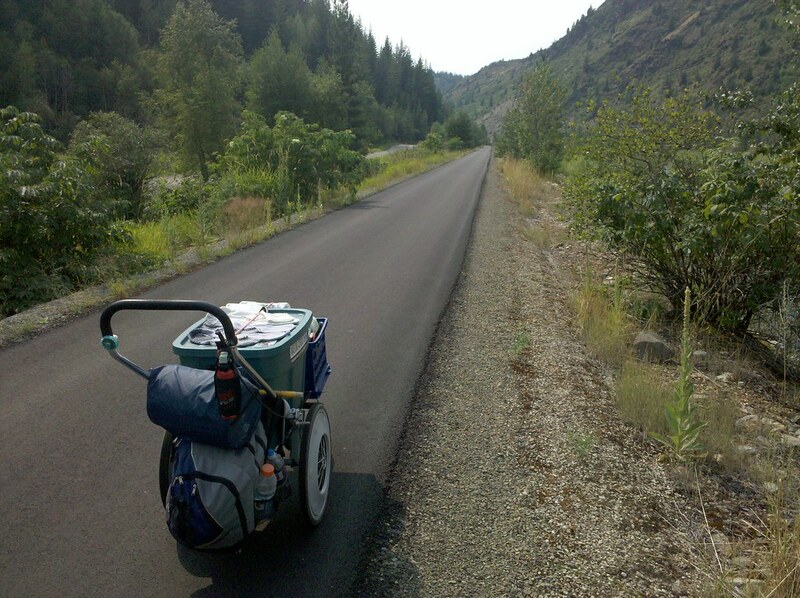 How wonderful – paved trail! For what length will this be under cart/foot? P.S. What is that green knob on the left handle of your cart. I see you are still drying your socks! I hope your journey continues smoothly, as smooth as the surface of this paved path! I can see the plunger handle of death! (well – the dog intimidator). :) I wouldn’t want Matt to run over anybody – He’d better ring that bell as warning! (or maybe he could alert the bears to his presence). hmmm. after this trip, is this cart eligible as an entry into the smithsonian? I think it should be a prototype for production of similar – for all of us wanting to go trekking! Loving the view. Safe travels Matt. Now this is a sigh of relief…. a paved path for you and the cart…. after all those rocks. Hope it’s a long trail !! This is nice, very nice. It also looks like there’s another older trail way over on the left side or is that a road of some sort? Any locals know? I do like the pathway, looks pretty newly paved. Gonna be a nice walk there for ya Matt. Enjoy it. It does look like another path over to the left. A gravel path!?!?! Clearly a “Rails to Trails” project, where an abandoned RR line has been turned into a biking/hiking path. Very nice. We have those here in Ohio. They’re all over the state. Learning something new every day. 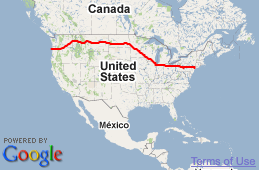 I didn’t know ‘rails to trails’ projects were in other parts of the country, too. It’s a great idea — RE-PURPOSING! Looks like Matt has his cart ‘staged’ for the Coeur d’Alenes dragstrip. Appears to be a dead straight quarter mile ahead. If you had a thick black marker you could lay down an impressive-looking but fake 2-tire burnout! I think the whole rest of the way is going to be as beautiful as this. There is nothing more beautiful than the northwest. Here’s more on the trail he’s on now. I am soooo envious. safe travels, Matt ! What an inviting and beautiful trail. It looks like the scenery would be georgeous and I bet you see all kinds of wildlife. I will have to visit this area someday soon. Matt- thanks again for sharing and the MATTMOBILE looks in great shape!!! This paved trail runs through most of Idaho (remember though, it isn’t very wide at this point) over an old railroad bed. The entire route carried a lot of mining ore in past decades, and a lot spilled out on the tracks throughout the route. The problem is that it was contaminated with heavy metals and became a serious health problem – much of it a superfund site. The answer was to “cap” it. It was determined that it wouldn’t be a health threat if it wasn’t accessible, so Union Pacific was required to pave it over, and it became a bike and walking trail. There are signs along the route in various spots that warn about going off of the pavement.